Officer Leslie Silva and Grizzly, who retired as of April, 11, 2017 from the police department in Darien, CT due to an inoperable tumor. DARIEN — Several months after going into service, Darien Police K-9 Grizzly is retiring early after being diagnosed with an inoperable tumor. 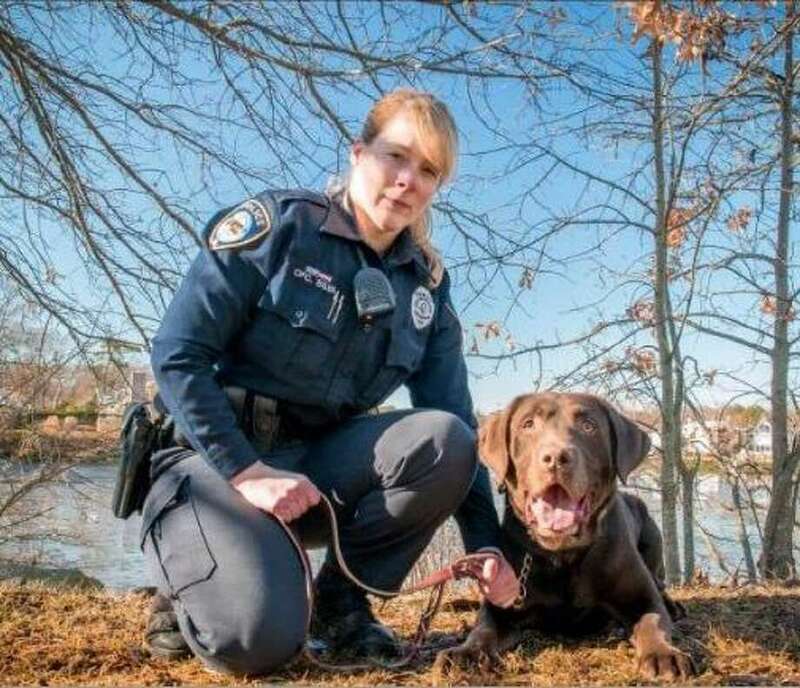 Grizzly, a 3-year-old chocolate Labrador retriever, joined the Darien Police in September 2016 and was placed with a handler, Officer Leslie Silva. After completing training through Superior K-9 Services and getting state and national certifications for narcotics detection, Grizzly and Silva began patrolling Darien together in December. Police said several months later, in February, Grizzly began limping and was showing signs of pain in one of his hind legs. Grizzly visited a local veterinarian who discovered the dog had a rare and aggressive form of bone cancer called chondrosarcoma. A cancerous tumor was rapidly growing in an inoperable area of his hip joint. Police consulted with a vet, an oncology specialist and several K-9 professionals and determined it was best to retire Grizzly and return him to the care of Superior K9 Services to make him comfortable in his final days. His last day with the department was April 11. During his time in Darien, Grizzly worked on patrol and in public relations, visiting local schools, doing public demonstrations and meeting with community members to educate them about the police department and K-9 program. When he wasn’t working, Grizzly enjoyed spending time with his handler and family and going for long walks. Superior K9 Services is currently looking for a new K-9 partner for Silva.